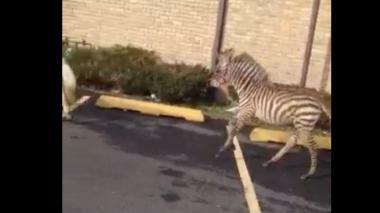 STATEN ISLAND — A runaway zebra turned heads on Staten Island Wednesday morning. 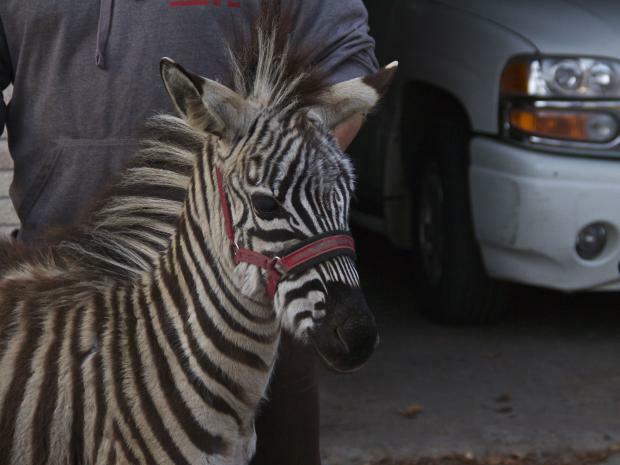 The 4-month-old zebra, named Razzi — along with his friend, a miniature pony named Casper — bolted from the yard they live in at Victory Boulevard and Travis Avenue about 9:20 a.m., as owner Giovanni Schirripa cleaned their pen, he said. The happy four-legged pair cavorted down Victory Boulevard, as amused passersby stopped to gawk at the unusual sight on the busy road. The animals' flight, including a trot through a local parking lot, was first reported by the Staten Island Advance. Schirripa, 31, a construction worker, caught up to the escaped duo just a few blocks away and coaxed them back home with a handful of hay, he said. "I just went there with some food and he came right out for me," said Schirripa, who added that the baby zebra was frightened by all the curious onlookers. Zachary Osher, 35, who owns Metropolitan Drapes & Blinds on Victory Boulevard, was sitting at his desk when he saw the zebra and pony pass his window. "It was like a herd on the move," said Osher, who raced outside and captured a video on his phone. "I thought it was early, maybe it's my third cup of coffee. It's so surreal." A few hours later, Razzi and Casper could be seen playing and nuzzling each other in the yard behind Schirripa's house, where he also keeps two dogs, a cockatoo, a peacock and a chicken. Schirripa paid $6,000 to buy Razzi from a Wisconsin breeder, with the goal of starting a petting zoo. "I wanted to get something different," he said. "I always wanted a zebra." When Schirripa picked up his new baby zebra, he spotted a shop called "Paparazzi" and got the idea for Razzi's name. Schirripa has held one petting zoo with Razzi so far, at a local Oktoberfest event last month, and he hopes to organize more. Caring for Razzi is similar to caring for a horse — "He's just a horse with stripes," Schirripa said — but zebras can be more temperamental. "It's a lot more work than I thought," Schirripa said. "They're a little more vicious." The city's Health Department said zebras are illegal to own as pets but are allowed in petting zoos, and Schirripa said he had the necessary paperwork. While 14-year-old Casper has escaped twice before, Schirripa said Wednesday was the first time Razzi had gotten out. The pony and zebra are inseparable and never leave each other's side, Schirripa said.